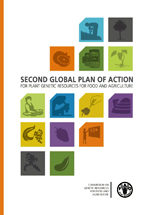 The Second Global Plan of Action addresses new challenges, such as climate change and food insecurity, as well as novel opportunities, including information, communication and molecular methodologies. It contains 18 priority activities organized in four main groups: In situ conservation and management; Ex situ conservation; Sustainable use; and Building sustainable institutional and human capacities. or to the: Chief, Publishing Policy and Support Branch, Office of Knowledge Exchange, Research and Extension, FAO, Viale delle Terme di Caracalla, 00153 Rome, Italy.